Plain and simple. 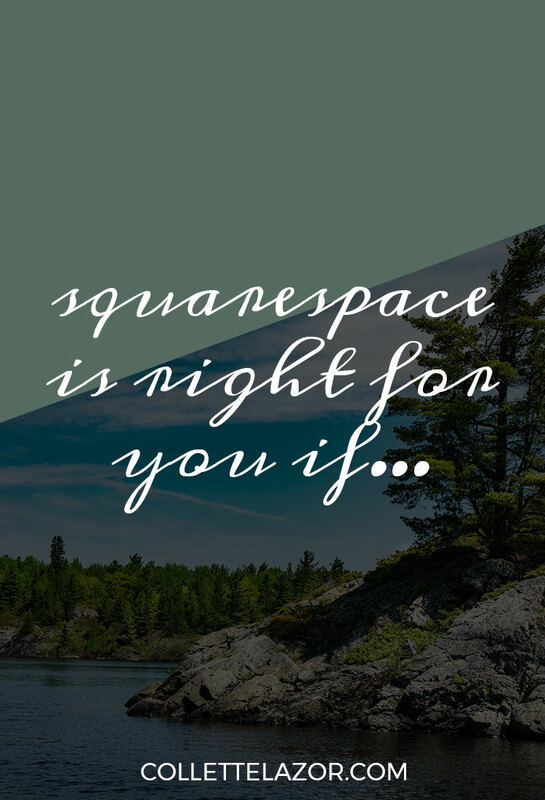 The awesome Squarespace features that I outline in this post all come back to this point. Squarespace is right for you if you want a website that looks good and is easy to update. It's also right for you if you don't want to worry about all of the backend stuff. I switched this website to Squarespace last year and I've been so very pleased with it. It's right for me, and here are a bunch of reasons why. Squarespace takes care of hosting (and domains, if you want) forever. No need to purchase server space or handle maintenance. You don't need an app for that. E-commerce, blogs, newsletter sign-up etc. Squarespace comes with with many features out of the box, so no need to search for plug-ins. No updating plug-ins or searching the web for help if something goes buggy. And, because it's built in, there is a consistent look and feel on all pages. There is a dedicated support team. While they won't help to adjust HTML coding, they will look at your website and try to provide a solution to the problem. On other platforms, you'll spend hours searching help forums to find someone with a similar problem or a developer to answer your question. The content management system is web-based and very easy to use. You'll be able to access it anywhere and easily make updates. Th templates are all very well made and designed for specific functions. You gain access to the full library and can switch easily at any time. When they add new themes, you get them. Plus, It's very easy to test drive a new theme, edit the style guide and preview before pushing anything live. All Squarespace templates come out of the box with a responsive design that works well on desktop, tablet and mobile devices. As you add content, the system works automatically to resize and manage multiple sizes for a flawless experience. As users continue to trend towards mobile and tablet, this is huge. Having a mobile friendly website also helps your relationship with good ol' Google. On top of simple and beautiful themes, you're going to love cover pages. These sleek designs work well as landing pages for product launches, newsletter signups and more. If you know some basic HTML and CSS, it's easy to add custom code injections on pages and within your styling guide.